Unit 4295 is a warm, cozy condo on the ninth floor. The earthy decor is sure to help you relax while you are enjoying your vacation. As you walk into the unit, you are struck with outstanding views. The open-concept floor plan allows you to see the ocean from the kitchen and living room! The floor-to-ceiling sliding doors make access to your balcony in the living room easy and keep the open-concept flowing. The modern, open kitchen houses everything you could possibly need to feel right at home as well as luxurious updates like granite countertops and new appliances. The unit also has a washer/dryer for your utmost convenience. The master bathroom has a king-size bed, private bath, and amazing picture windows. The master bath has a deep spa tub and a standing shower. The guest bedroom has two twin beds, while the queen-size sofa sleeper in the living room give you room for two more guests! Daily maid service is an option – available upon request for an extra fee. The location of Beachside II 4295 is outstanding. Each morning we watched dolphins swim by in the crystal clear water from our balcony. The condo was clean and some updating had taken place. The couches and bedding had been replaced. However, the bathrooms and kitchen appliances were dated, but in good working order.The beach chairs provided by condo were in poor condition. One completely broke while we were there. I turned it in to the office, but did not get a replacement. That is not a deal breaker, but if you state beach chairs are provided, they should be in decent condition. That being said, it would not keep me from renting this condo again. The staff was easy to work with, and responded to my questions in a timely manner. for a two bedroom condo, 4295 was very roomy. I would stay here in the future. 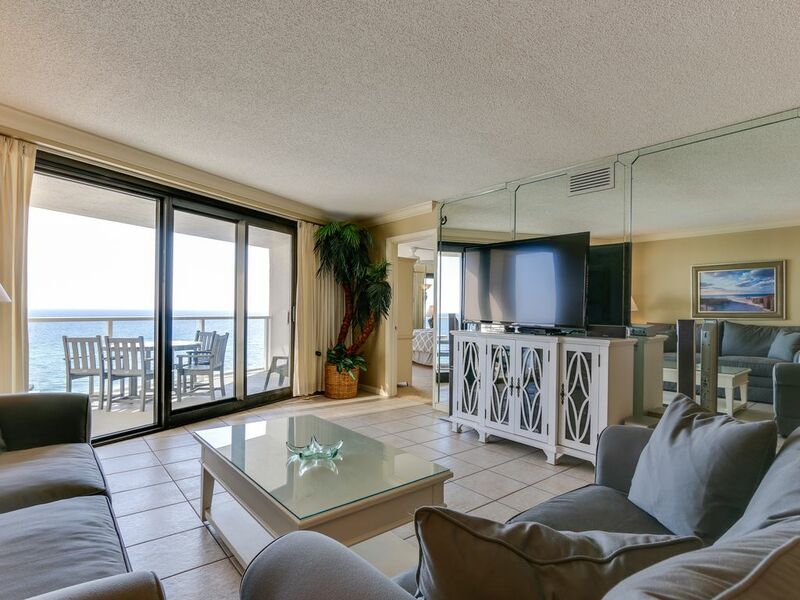 Thank you Phyllis for booking with us and staying in unit 4295 at Beachside II. We are so sorry that your trip had a few issues, and continue to strive to have those glowing all 5-star reviews; we apologize for any inconvenience with the beach chair - we actually keep a couple extra in our upstairs storage unit so we may have misunderstood your need to bring a new one ASAP; it has been replaced since to provide the 2 the unit are guaranteed to come with. We hope in the future, if you decided to give us a change to wow you, we are able to not only offer you our returning guest discount, but also able to provide you with a unit that is more to your liking; as well as have our staff dazzling you with their amazing customer service. Happy future travels. Wonderful! When you get to worry less & relax more, we've done our job. Thanks for the 5-star review, we appreciate it and are so excited you loved your vacation. Great location, awesome resort, good time of year, beautiful views especially from bed in master. I felt as if I was on a cruise ship!!! Wow! Sounds like you've found a little slice of heaven! Thanks for the great review, we appreciate it and are so happy y'all loved the condo and your time at the beach! Dealing with Gibson was a pleasure. Very quick and smooth check in. I will be using Gibson again for my next trip. That's music to our ears! When you get to relax more & worry less; we've done our job. Thanks for the excellent review, we appreciate it and look forward to your next visit! Really enjoyed doing business with Gibson. The check in was extremely smooth and easy. I will be back with Gibson again, they were very easy to deal with and very helpful. Our goal is for you to worry less & relax more! We appreciate the kind words and are so thrilled you enjoyed your stay, it's our pleasure to help any way possible. Thanks for the 5-star review, we appreciate it. Be sure to mention our repeat guest discount on your next visit. We love Beachside II! This was our third year renting through Gibson in this building... and this year we stayed in the same unit we rented last year. Everything has been clean and in working order the last 3 years. We love the ability to walk right onto the beach and the kids love the access to the pool. The restaurant next door is a nice perk as well. Thanks for a great stay! We will be back! You're so very welcome Jennifer & family! We adore our repeat guests and appreciate you so much. We're so thrilled to hear your family had such a great time! Can't wait to have you back again next year!